Bird Rock Hotel is a refreshing combination of a historic hotel exterior and stylishly modern interiors. Recommended by Sunset Magazine as the place to stay on San Juan Island. Looking for a romantic getaway or the perfect location to host an upcoming retreat? Visit Friday Harbor House in the San Juan Islands. The inn is easily accessible via a serene ferry ride through the islands or a quick float plane trip from Seattle, Bellingham, and Vancouver. Located two blocks from the Friday Harbor ferry terminal, Friday Harbor House sits atop a bluff overlooking the scenic harbor. The Orca Inn hotel is located in Friday Harbor, Washington on beautiful San Juan Island. Ideal for business travel and inexpensive getaways alike, The Orca Inn features accommodations to fit the budget conscious traveller. Just seven blocks from downtown Friday Harbor, we offer rooms with a variety of bed choices, microwaves and refrigerators. Explore our Inn and discover how affordable vacationing in Friday Harbor can be. Located just minutes from the Friday Harbor ferry landing, the Discovery Inn features a park like setting with gardens, a large seasonal outdoor jacuzzi, sitting areas, decks and barbeques. Each room features a private bath with one or two queen size beds, coffee maker and TV. Guests have access to free WiFi and the town's library is next door. We are a family friendly, non-smoking and pet free facility. Walk onto the ferry in Anacortes for a scenic ride to San Juan Island or hop onto a Kenmore Air Seaplane departing from Lake Union in Seattle. You will land in downtown Friday Harbour, and then take a complementary shuttle provided by the Best Western Friday Harbor Suites to your hotel. Today you can enjoy an exciting day on the water with San Juan Excursions or Western Prince for a guided whale watching tour. The captain will take you to see amazing wildlife such as orcas, porpoise and many different types of sea birds. Once you return, you will be ready for a delicious steak or seafood dinner at the Peppermill Restaurant located at your Friday Harbour hotel. If you are still feeling adventurous stroll downtown and enjoy some live music at one of many nightlife venues in Friday Harbor. Enjoy a hearty American style breakfast at the Hungry Clam or go local & organic at the Market Chef. The Crystal Seas Kayaking courtesy shuttle will meet you at the ferry landing to take you to Snug Harbor. Located along the west-side of San Juan Island, your guides will give you a quick lesson at the kayak docks and then take you out on a adventurous kayaking tour. The views of the surrounding mountain ranges and abundant wildlife will make this trip one to remember! When you get back to the kayak docks, a shuttle will take you back to Friday Harbor where you can catch the ferry back to the mainland or fly on a Kenmore Air Seaplane back to Seattle. Take the Washington State ferry to Friday Harbor as part of Washington's scenic byway. Check into the Bird Rock Hotel; a beautiful modern hotel located in the heart of downtown Friday Harbor. Today you can take a scenic drive around the island if you bring your car; or you can rent a car, moped or bicycle to go sightseeing. Start by heading to the south end of the island where you can walk through the golden fields of Mt. Finlayson and American Camp; possibly seeing rabbits, fox, deer and bald eagles. Relax in the sun at South Beach or keep going towards the west side of the island. Check out Deadmans Bay or hike along the trail to the lighthouse at Lime Kiln State Park. Tonight you can enjoy dinner at a variety of upscale restaurants such as Downriggers, The Place, Vinny's Restaurant, The Backdoor Kitchen, The Coho Restaurant or Duck Soup Inn. After a delicious breakfast at your hotel, head to Western Prince for a guided whale watch cruise searching for orcas, porpoise, black oyster catchers and other sea life. Once you return to port, you will be ready for another delicious meal at on of our local restaurants. If you would like to go casual tonight try Friday's Crab House, The Hungry Clam, Mi Casita or Dos Diablos. Walk to the ferry landing to meet your Crystal Seas Kayaking guide. They will shuttle you to the west-side of San Juan Island for a guided 3 hour or day kayaking tour. Watch for eagles, harbor seals, porpoise and orca whales while your guide talks about the local ecosystem. When the tour ends, your guide will take you back to Friday Harbor where you can catch the ferry back to the mainland. Ride the ferry to Friday Harbor and then check-in to the Earthbox Motel and Spa. Here you can swim in their heated pool, get a hot stone massage or visit their cafe. Spend the afternoon walking around Friday Harbor; visiting the art galleries, local shops, activity centers and restaurants. Grab breakfast and then head to San Juan Excursions to check in for your whale watching and wildlife cruise. Enjoy a comfortable boat ride aboard the Odyssey to see orca whales, sea lions, sea birds and a variety of other wildlife local to the San Juan Island archipelago. When the Odyssey returns, you can walk to the Coho Restaurant for dinner. Rent bicycles from Island Bicycles and head to the northern part of the island. Stop at San Juan Vineyards, Roche Harbor and the Pelindaba Lavendar Fields Day Spa along the way. After sightseeing all day you can enjoy dinner at one of Friday Harbors delightful restaurants, from Thai to Pacific Northwest to Italian. If you can try to frequent a restaurant that serves products and produce from the San Juan Islands. Today you can head to the west-side of the island where you will paddle the beautiful coastline on a 3-hour or day kayaking tour with Crystal Seas Kayaking. You will be surrounded by evergreen islands and beyond that the snowcapped mountains of the Olympic Peninsula. Look for seals, eagles and orcas as you glide along the water. When your tour ends, you can head back to the ferry landing to depart Friday Harbor. 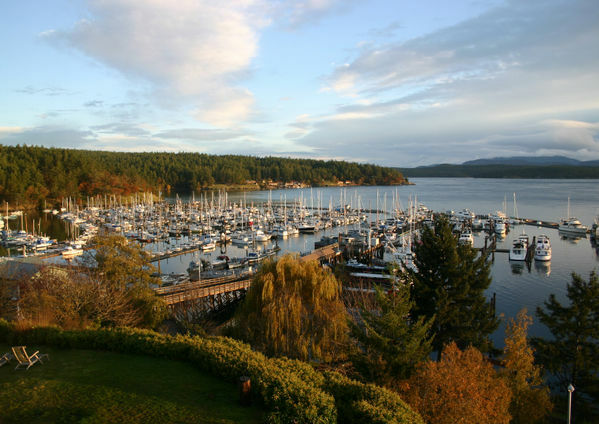 Hotels in Friday Harbor, Friday Harbour Hotels Washington, Friday Harbor hotel deals, Friday Harbor Spa Hotel, Friday Harbor Hotels with Pools.